Wittenborg Online: Meet 'Team Wittenborg' in Vienna! Meet 'Team Wittenborg' in Vienna! Hospitality students from Wittenborg Vienna recently got the chance to attend and work behind the scenes at the prestigious Diplomatic Academy Ball in Vienna. 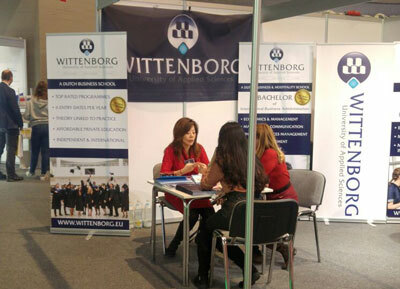 Meet 'Team Wittenborg' at the annual Education Fair in Vienna - we are there until Sunday! The team has been talking to many students interested in an international management degree and is looking forward to meeting you too! Come and meet us at BeSt3 Education Fair in the Wiener Stadthalle. BeSt3 Education Fair in the Wiener Stadthalle, Vienna, taking place from 1 – 4 March, 2018. With around 350 exhibitors and 75,000 visitors a year, BeSt3 is the largest education fair in Austria. Important institutions from the fields of work, study and further education are brought together under one roof. Find us in the Economy area at Booth W63, from 09.00 – 18.00h. You can find more information regarding the BeST3 Education Fair here: https://bestinfo.at/en/.